My grandmother Ruth Link Shaw of Statesville, North Carolina, kept a perfect house and made perfect food while wearing aprons that covered her whole body like welder’s garb — not that she ever got a spot on one of them. And she never wanted anyone to know exactly how she produced those divine pound cakes and crispy fried chicken she turned out, so she never wrote down a recipe. But you can’t keep a good deviled egg secret, so I re-created her tart, creamy treats from my memory and from talking with other members of my family. You should make these very smooth, just like my Ma-Ma did. Combine the thoroughly mashed yolks and mayonnaise, then stir in the mustard and vinegar. Stir in the salt and pepper, then taste and adjust if necessary. Stir well with a spoon to achieve a creamy texture. 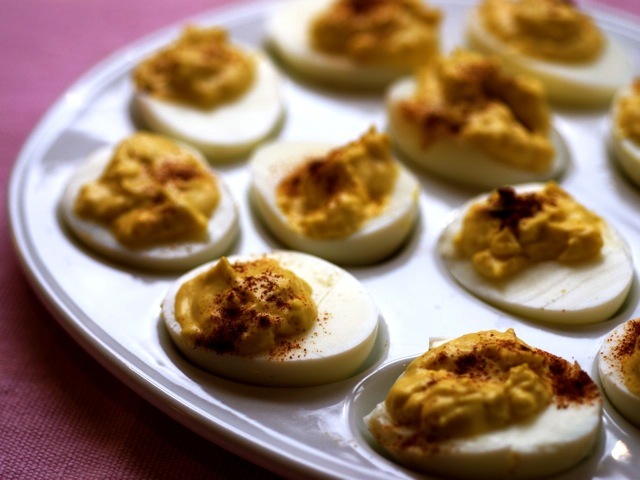 Fill the egg whites evenly with the mixture and garnish each egg half with paprika.